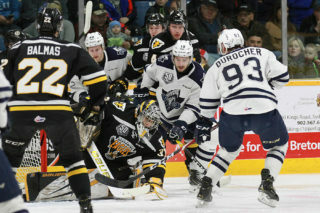 For the first time in 2018-19, the Screaming Eagles will take on a non-divisional opponent as the Blainville-Boisbriand Armada come to town for a Thursday night clash at Centre 200. The Eagles come into the game on a two game winning streak, fresh off a 5-2 victory Tuesday night in Moncton. Brooklyn Kalmikov became the first player to ever record a hat trick at the new Avenir Centre against the Wildcats, while Declan Smith added three assists. In the young season the Eagles are 3-2, with a 1-1 record at home. Blainville-Boisbriand has played just three games, posting a record of 2-1, with the only road game being an opening night victory in Shawinigan. it’s a different look to an Armada team that has lost in the QMJHL final in consecutive years, with one notable change being behind the bench. With Joël Bouchard departing to the AHL’s Laval Rocket, former Victoriaville coach Bruce Richardson has taken over at the helm. There are some notable ties between the Screaming Eagles and the Armada rosters. In the off-season the clubs traded players that they drafted in the first round of the 2015 QMJHL draft, as defenseman Antoine Crête-Belzile went to Cape Breton and forward Peyton Hoyt went to Blainville-Boisbriand. Tonight will be Hoyt’s first game back in Sydney. 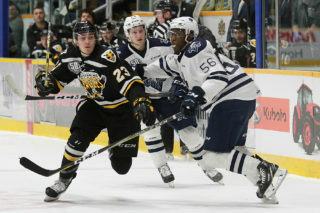 Screaming Eagles players Kyle Havlena and Shaun Miller came over from Blainville-Boisbriand in a mid-season swap last season, while fellow Eagles Mathias Laferrière (another first round QMJHL pick) and Félix Lafrance both appeared as affiliate players for the Armada before the move to Cape Breton. Blainville-Boisbriand forwards Luke Henman and Antoine Rochon, as well as defenseman Pascal Corbeil, were all drafted by the Eagles but did not appear in any games in black and gold. Corbeil, a skilled offensive overage blueliner, has also yet to appear in any games this season due to injury. 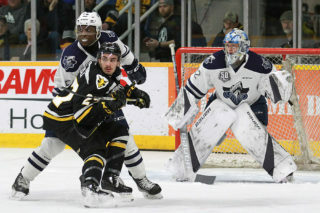 Thus far in the early part of the campaign 19 year old forward Joël Teasdale has led the offense for the Armada with four points in three games, following a 32 goal campaign last year that earned him a contract with the Montreal Canadiens. Henman was drafted by the Carolina Hurricanes in June and is also a key part of Blainville-Boisbriand’s offense. The Eagles, in addition to Kalmikov’s recent goal scoring prowess, have received consistent offense from both Mathias Laferrière and Egor Sokolov. Both have recorded a point in every game, and Laferrière’s nine points have him tied for fourth in the QMJHL in points. Between the pipes Kevin Mandolese has been given the ball for the Eagles thus far this year, starting four of five games and stopping 33 of 35 shots in the win against Moncton. 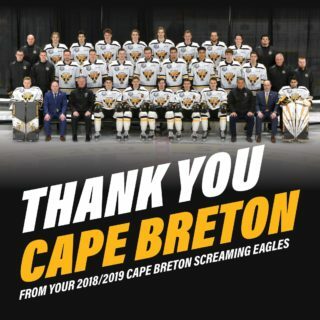 Tickets for tonight’s game can be purchased at the Centre 200 box office, by phone at 902-564-2200 or online at https://tickets.capebreton.ca/Online/default.asp Go Eagles Go!